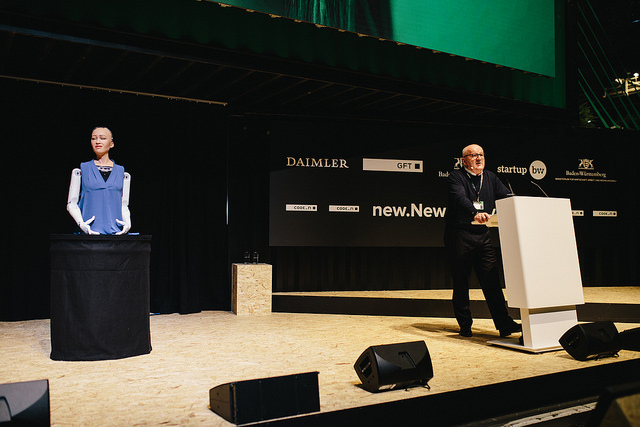 new.New Festival 2018 was opened with a discussion panel between Ulrich Dietz (Initiator CODE_n GmbH), Moritz Gräter (Managing Director CODE_n GmbH), Dr. Nicole Hoffmeister-Kraut (Minister of Economic Affairs, Labour and Housing for the State of Baden-Württemberg) and Sophia the Robot. Sophia is a humanoid robot who came all the way from Hong Kong to attend the festival in Stuttgart. She was the perfect taster for the festivals main focus: Artificial Intelligence (AI). The event lasted 3 days, from Monday the 8th of October to Wednesday the 10th of October. Roundabout 200 companies displayed their ideas and products, each sat in a little booth made out of wood and neon green tape. 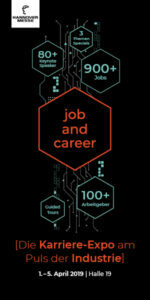 Of these companies, more than 100 were start-ups, of which 50 were the finalists of the CODE_n CONTEST. Aside from the companies, there were almost 220 speakers from 20 countries giving insights into current developments relevant to Intelligence X.O – showing really just how international and global this festival was. The five individually designed stages hosted speakers for over 70 hours. On Monday, the press conference was held by Moritz Gräter, Ulrich Dietz, Nicole Hoffmeister-Kraut, the current CEO of GFT Marika Lulay, and the Head of Lab1886 Susanne Hahn. These five individuals were also part of the nine jury members for the CODE_n CONTEST. Over 300 international and national startups expressed an interest in the 6th contest, and the jury chose the Top 50 to be present at the new.New Festival 2018. These Top 50 were from across 15 countries. The Top 50 of the start-up contest were joined by another 80 other start-ups from all over the world. 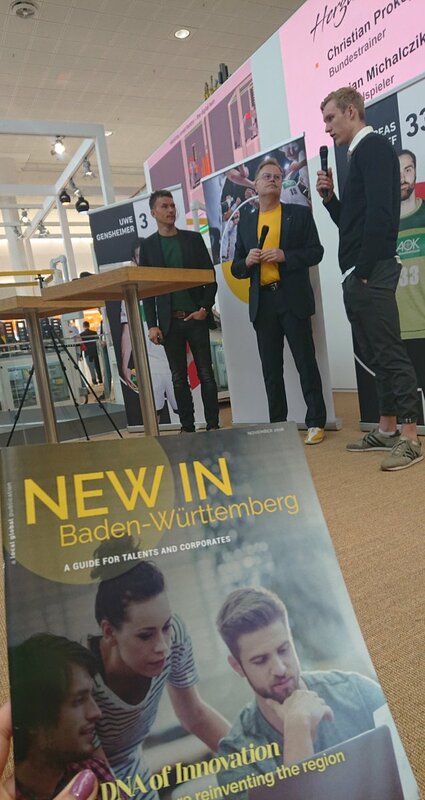 They presented themselves as the accelerators of the state Baden-Württemberg. On Tuesday, the Top 10 of the start-up contest gave their final pitches. They each had 2:30 time, and when they only had 30 seconds left, a big timer appeared on the Main Stage screen behind them, so that the whole audience could see their time ticking down as the start-ups hurried to finish their presentations. 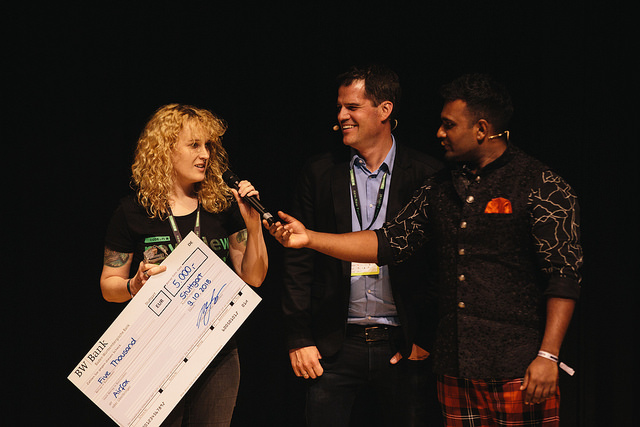 It was so international that the Top 10 Startups of the CODE_n CONTEST were from six different countries. 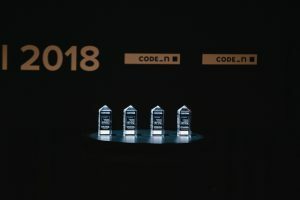 The winner of the “Overall CODE_n Award” was Airfox, an innovative company from the USA. 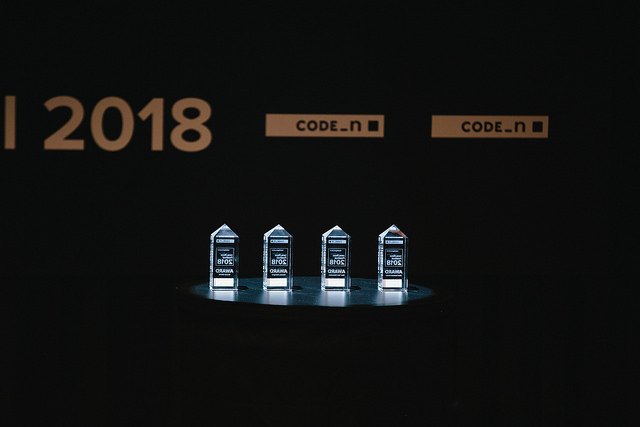 Out of 313 applications from 42 countries, the Boston based start-up won the “Overall CODE_n Award“ and the prize for the “Best Business Model”. Airfox has developed a blockchain finance Android app that allows for micro-loans to be sent across people without being bound to a bank. They received the prize money of €15,000 for winning two awards. Winner of the category “Best Industry Disruptor” was the German start-up thingsTHINKING. This young company is based in Karlsruhe and develops semantic software solutions that allow for computers to understand human speech. The winner of “Best Tech Innovation” was the Jerusalem-based company Six Degrees Space. The Israeli start-up has developed an innovative optical tracking system that can be used in a variety of hardware systems, such as cars, drone and VR headsets. It combines electronics, optics, and algorithms to offer ultra-fast optical tracking. 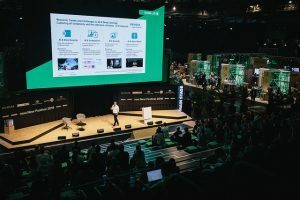 CODE_n has had over 1,900 young companies from 85 countries since 2012. First winner of the contest was the then unknown Hamburg-based start-up MyTaxi in 2012. This was followed by Changers.com and Greenclouds (2013), Viewsy (2014), relayr (2015), and Xarion (2016). 2015 winner relayr, barely 5 years old, was so successful after the contest that the insurance group Munich Re (Münchner Rück) acquired it in September for $300 Million. 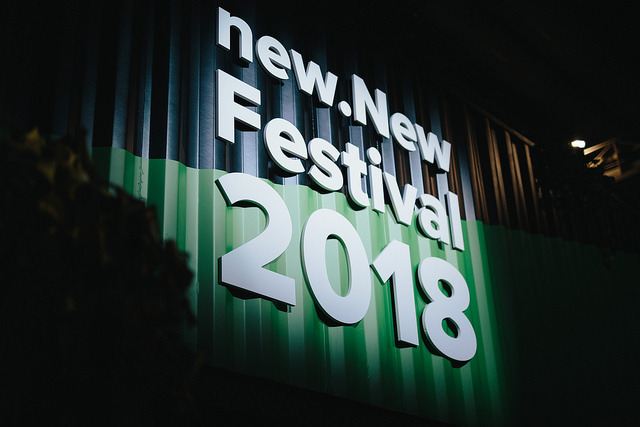 The media coverage for the new.New Festival 2018 was impressive: there were more than 2100 news articles, radio broadcasts, and TV reports. Furthermore, the event was mentioned on social media over 233 million times and reached over 145 million readers, listeners, and viewers. Next to the talks and pitches, there was a large selection of workshops and interactive activities for visitors and fellow entrepreneurs, but also corporates, to join. In the middle of the hall, you could see a huge Daimler truck. Inside this Lab1886 truck, workshops would take place daily. Aside from all the business, the festival was accompanied by music, art, and even meditation every few hours by a mindfulness coach. All in all the new.New Festival 2018 in the Hanns-Martin-Schleyer Halle in Stuttgart was aesthetic, intriguing and successful.